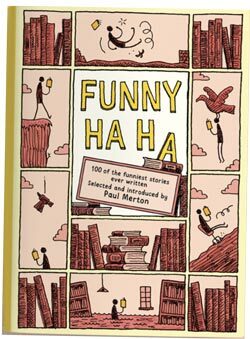 Paul Merton has selected 100 of his favourite funny short stories for a new anthology to be published later this year. The comic has also written an introduction to the collection, Funny Ha Ha. which includes contributions from authors from Anton Chekhov to Ali Smith and from P.G. Wodehouse to Nora Ephron. It is being released by independent publishing house Head Of Zeus, which says the book, covers a range of comic styles, including surreal, slapstick, gross-out and sly wit. The 800-page book is due to be published on November 19, priced £25 (or £7.99 on Kindle). Click here to order. We do not currently hold contact details for Paul Merton's agent. If you are a comic or agent wanting your details to appear on Chortle, click here.